Only a handful of these issues are known to exist. They were originally printed for distribution to schools and churches to canvass opinion on the suitability of The Eagle’s content prior to the main print run. In high grade, this particular copy made £990. 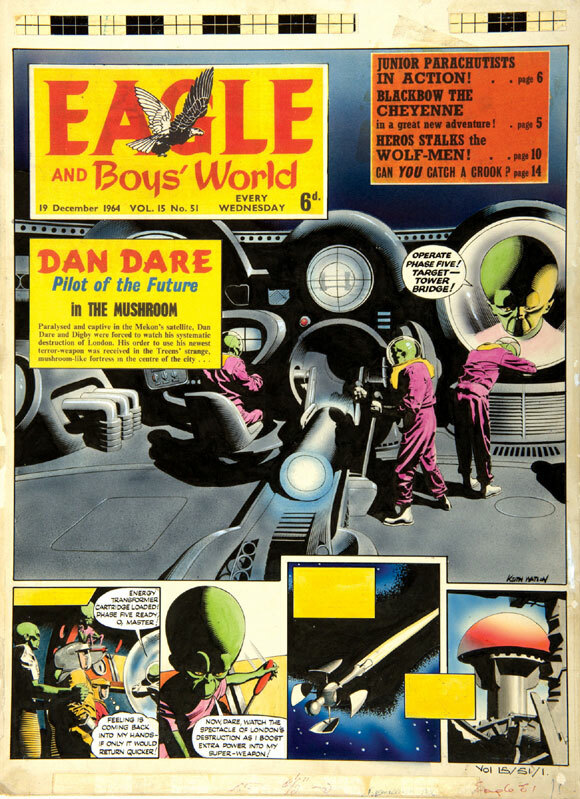 Keith Watson’s signed cover artwork for The Eagle volume 15 No 51 (1964) showed Dan’s arch- enemy, The Mekon, targeting London’s Tower Bridge with his deadly Energy Transformer. £1980 was transformed for this brightly coloured piece. 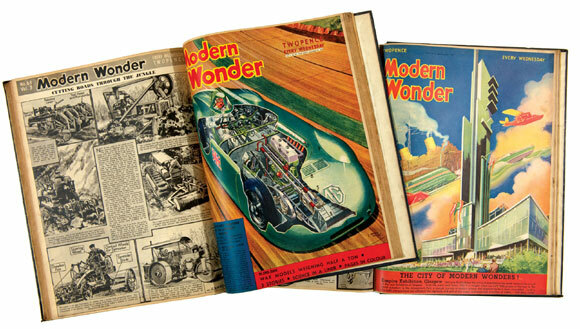 Issues 1-72 of Modern Wonder were offered here in 3 bound volumes. With some excellent art deco covers by Bryan de Grineau and cutaway drawings by Leslie Ashwell-Wood £290 took away these adventure and science fiction magazines. 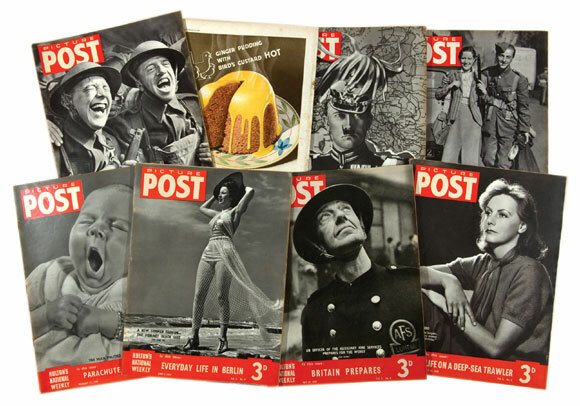 46 issues of Picture Post during 1939 showed Britain preparing for war in that magazine’s ground breaking photo-journalistic style. With good covers and some rusty staples £180 was successfully bid. Dandy’s first Fireworks issue is a genuine rarity. The winning bidder paid £363 and told us he had been after it for some years. We checked our ComicSearch files and saw that last one we had offered was back in 2000 and it had sold for £290. In this wartime propaganda issue, Desperate Dan is awarded the Iron Cross by Hitler for bombing Nelson’s Column (with butter)! £145 was evenly spread. 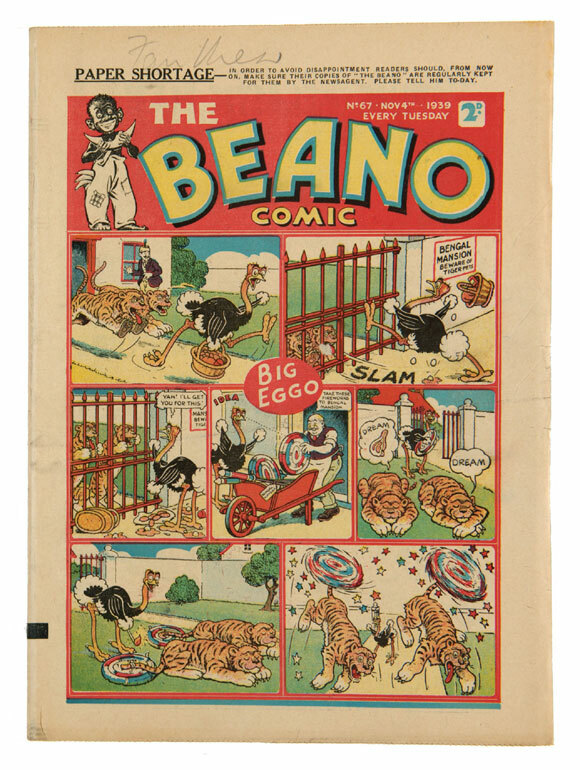 The Beano’s second Fireworks issue had a wartime shortage notice on its front cover margin but there was no shortage of interest in its £175 winning bid. More fireworks here as Jimmy And His Magic Patch foiled the Gunpowder Plot. One of three issues in high grade from 1945, a strong £363 won the day. 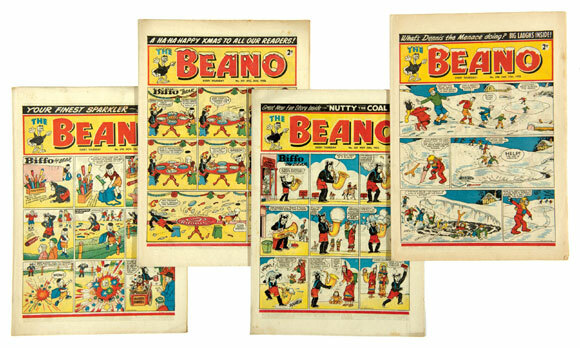 The complete year of Beano for 1953 heralded the first appearances of Rodger The Dodger and Minnie The Minx. Minnie maxied £601, or just under £12 apiece. 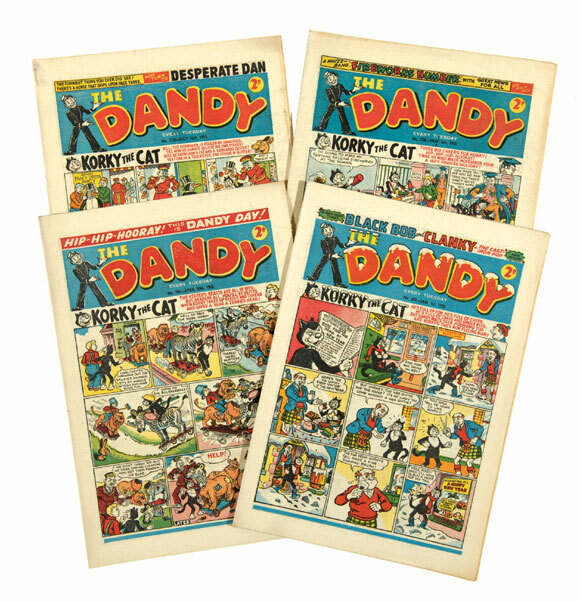 This near complete run of 47 high grade Dandys from 1955 only missed four issues and £418 or £9 each took them away. 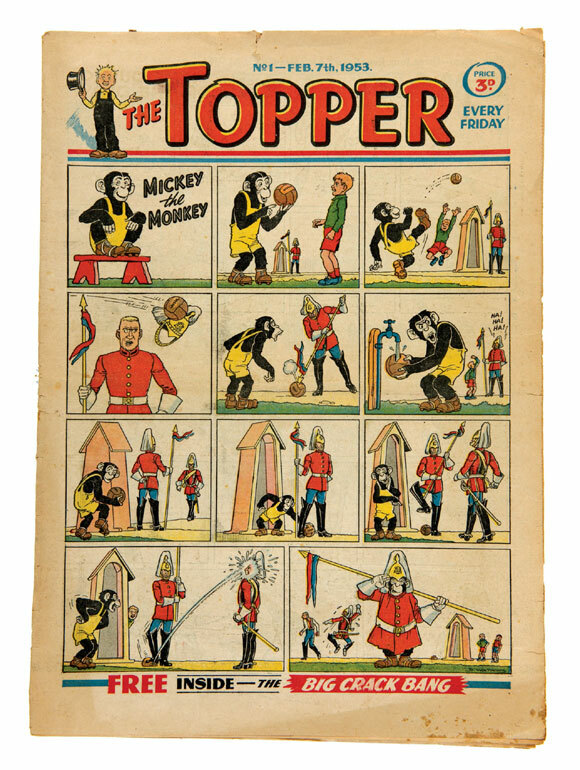 Even with tears and spine wear this [vg-] copy of Topper No 1 found £303 as the appeal of Mickey The Monkey and Beryl The Peril is clearly undiminished. Original tinplate signs are mostly available in damaged rusty state as they were largely used as outdoor advertising nailed up outside shops in all weather conditions. 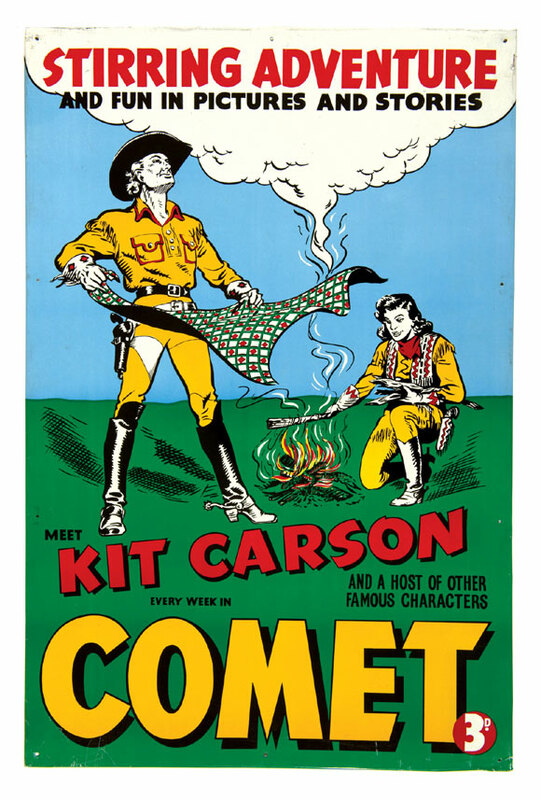 Our 1950s Kit Carson/Comet Comics sign was in very fresh condition and represented a good buy at £193. 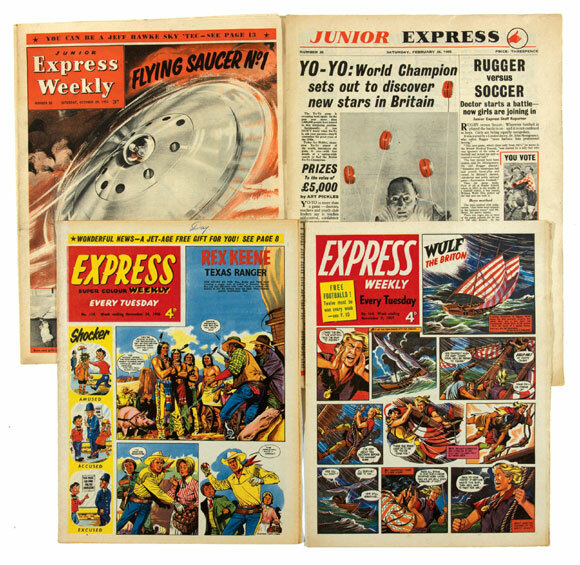 A good run of Junior Express which became Express Weekly with No 74 was peppered with key British artists and characters. 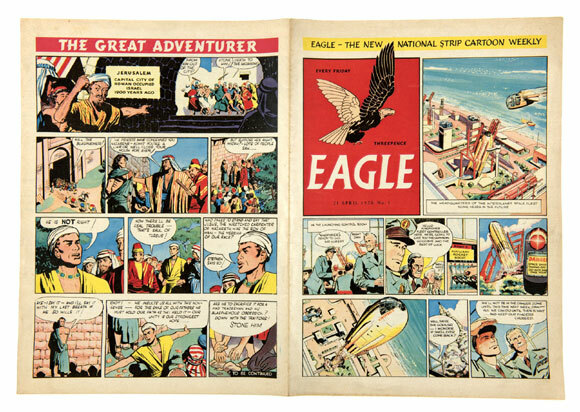 Jeff Hawke, Journey Into Space, Gun Law, Wulf The Briton by Ron Embleton and Red Cloud by Harry Bishop were just a few of them and 148 copies between 1954 and 1957 secured £473 or £3.50 each. 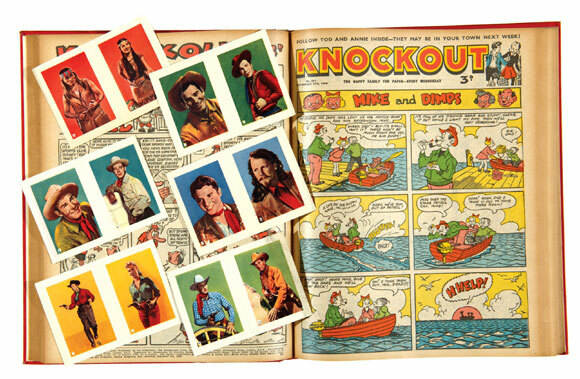 The complete set of 12 free gift Cowboy Photos heightened the appeal of Sexton Blake, Johnny Wingo and The Space Family Rollinson in The Knockout’s 1954 full year. £264 was the heavyweight winning bid. 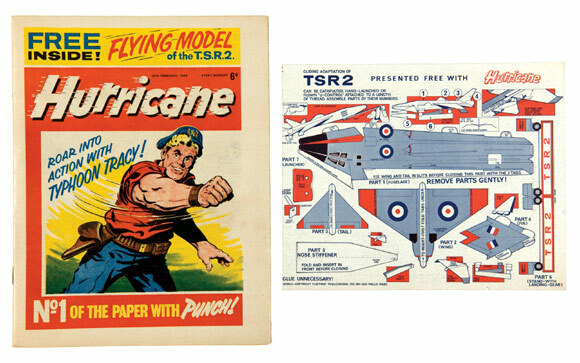 Hurricane No 1 was complete with its free gift TSR2 model glider. Plane sailing at £165. 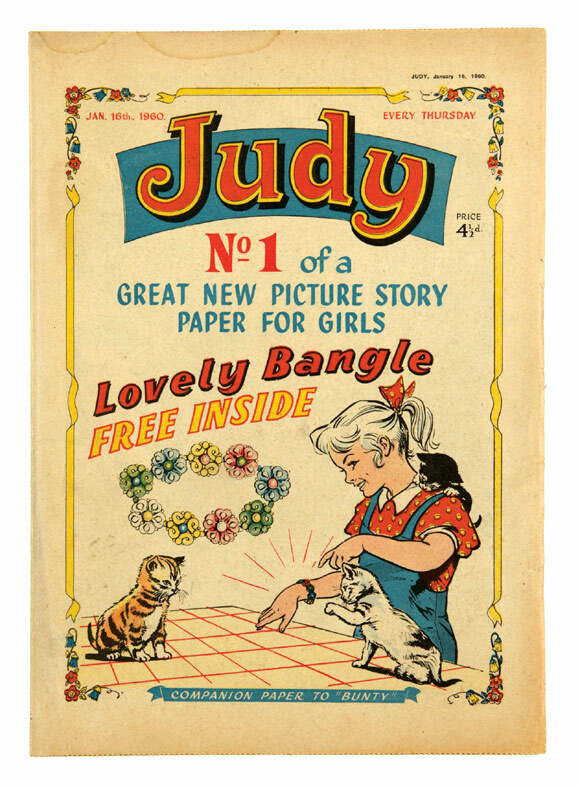 Judy No1 starred the eponymous Judy, The Runaway Princess and Sandra Of The Secret Ballet. £104 raised the barre. An artwork from Don Lawrence’s Trigan Empire series had Janno opposing a giant tentacle robot. Offered at £750-800, the piece was secured at £1100. 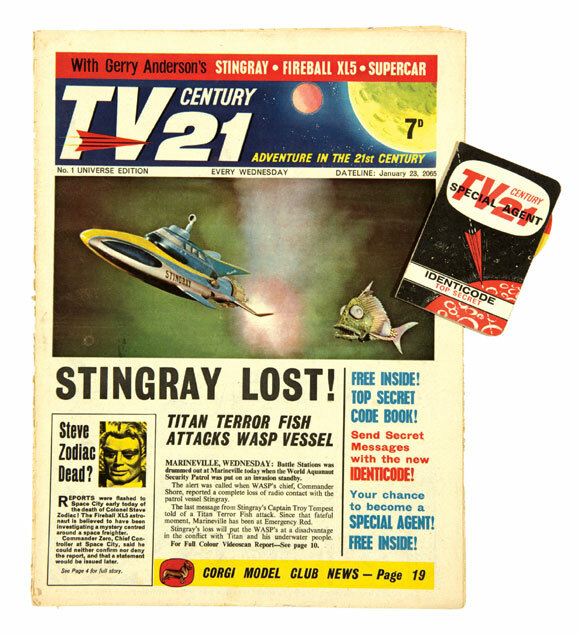 TV Century 21 is an iconic 60s title. The No 1 had its free gift Identicode Top Secret Decoder which had the owners name inscribed within. Perhaps he should have used invisible ink although £161 was firmly underwritten. 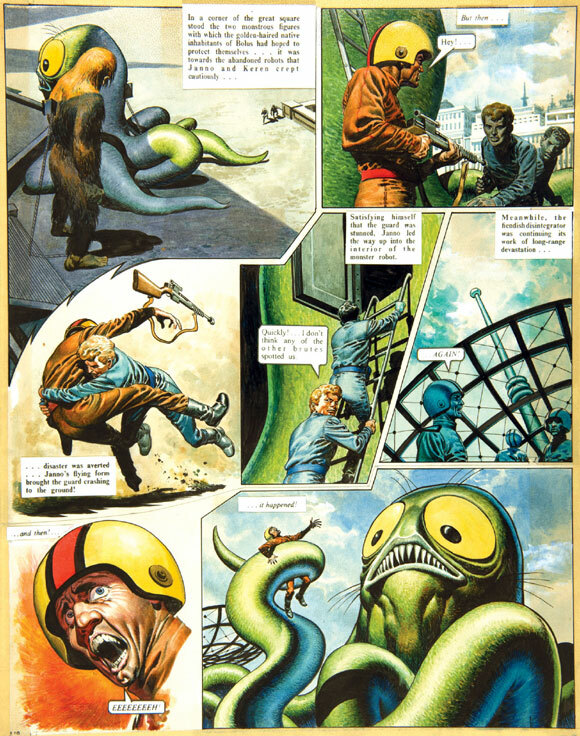 A further eight early issues in [fn/vfn] grades were taken to £44 each. One of the key titles of 1960s, Valiant, starred Captain Hurricane, The Steel Claw with comedy provided by The Nutts. The first thirteen issued were enclosed in a bound volume and a titanic bidding battle resulted in a record £425. 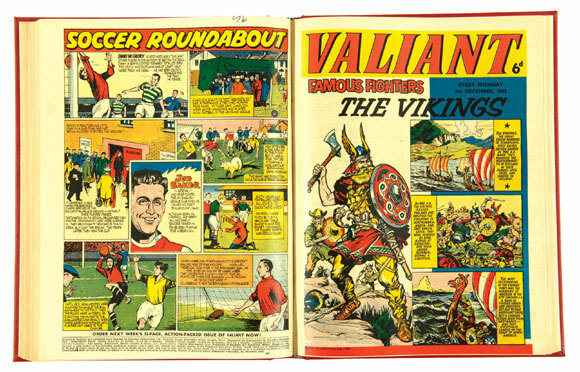 Valiant indeed. Seventies girl’s comics are finding their mojo. 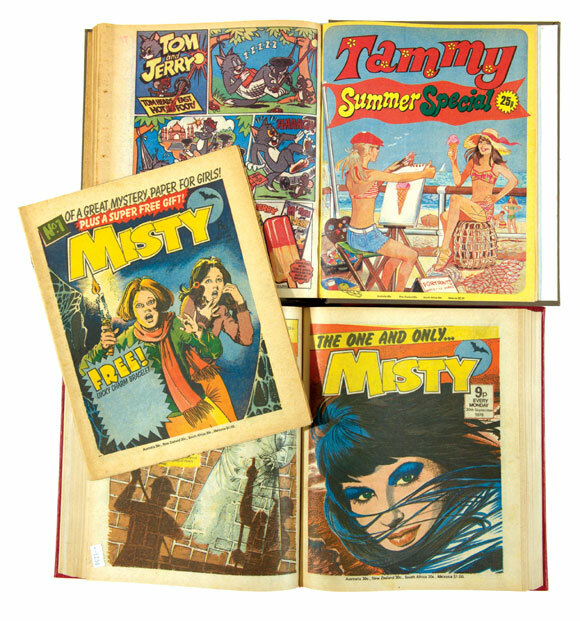 Most issues of Misty between 1-45 and Tammy and her rarer Summer Special totalled 72 comics in all and £247 in particular. 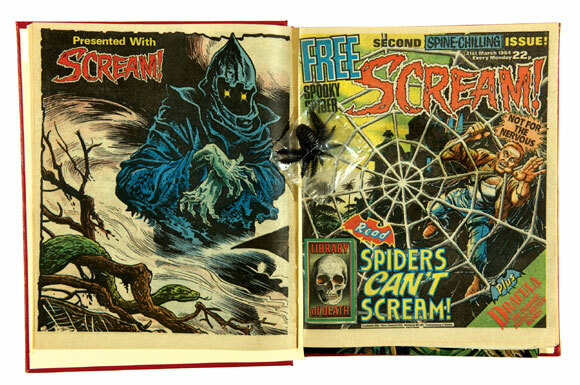 Scream only ran for 15 issues in 1984 and here they all were with No 2 free gift Spooky Spider and Holiday Specials 1, 2 and 3. Bound in a volume £143 raised the decibel level. 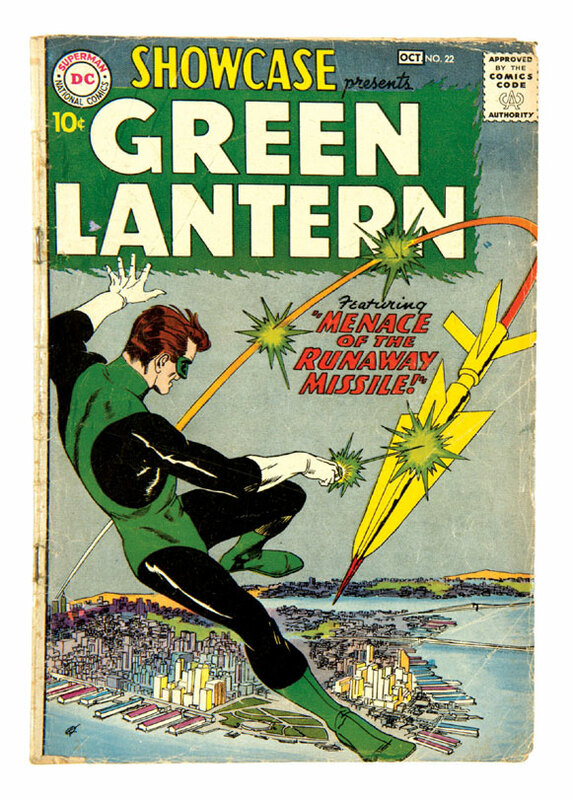 Our US section offered an early run of Silver Age Green Lantern. 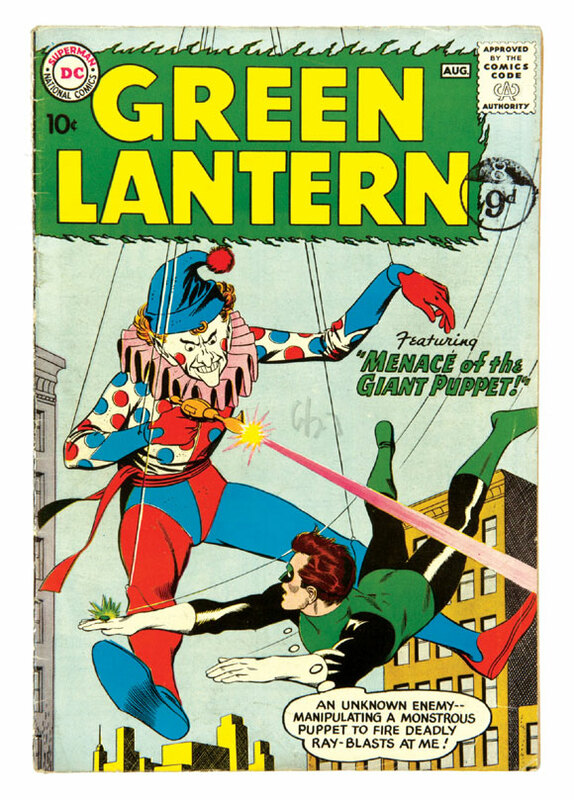 His first appearance in Showcase #22 made £242 in [gd] grade and Green Lantern #1 £325 in [vg+]. .Marvel’s blockbuster movies continue to reinvent and update that publisher’s wide canon of characters. The recent Avengers film has become one of the five highest grossing movies of all time and the early comics benefit accordingly. 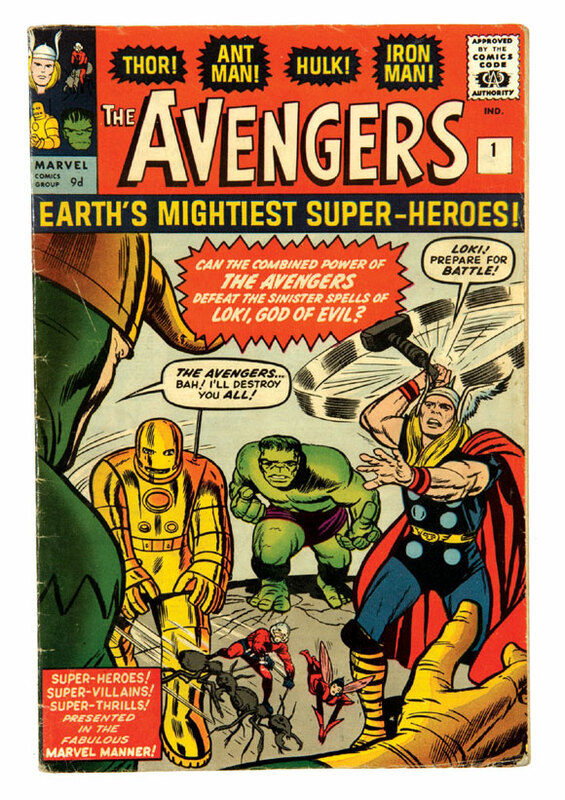 We presented a [vg] pence copy of Avengers #1 with no major defects and an estimate of £300-350. This was totally ignored as Iron Man, Thor and The Hulk battled to £742..
Whilst one of Marvel’s titles does record business at the box office, one of D C Thomson’s dies another day. 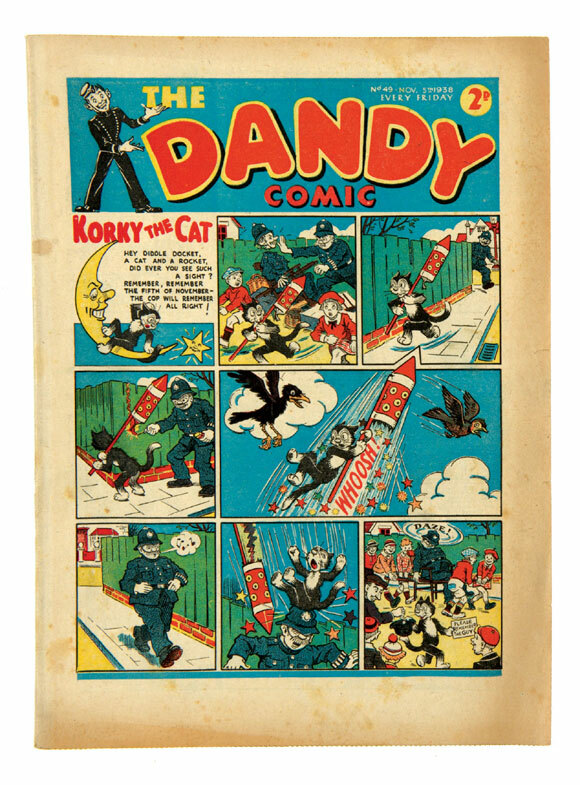 I’m referring, of course, to the imminent demise of The Dandy, whose published version will cease on 4 December 2012, seventy-five years after its 1937 launch. 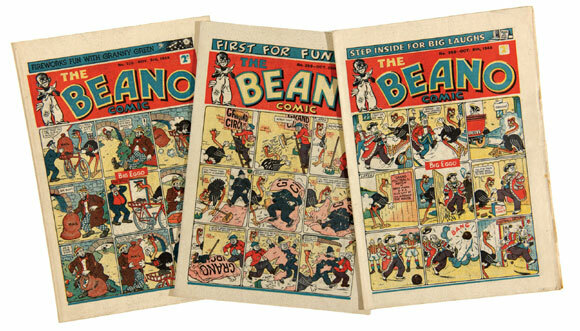 As a boy growing in London’s Maida Vale, I used to queue at the newsagent’s to get my copies of Beano and Dandy every Tuesday and Thursday in the 1950s. Like most kids, Desperate Dan was my favourite and shaving with a blowtorch and scratching his back with barbed wire were only some of the stunts that produced wide-eyed amazement and laughter week after week. It was only later that I realised the important work that Dan had done in 1942 when he drunk The Baltic dry thus scuppering The German Navy and winning the war for The Allies. He did have his failures, of course. As Britain was so short of metal to make our tanks and planes, Dan was ordered to find as much as possible for the war effort. His brilliant scheme was to use a giant magnet to do this but the only thing it attracted was Goering with his chest full of medals. Propaganda at the time suggested that the enemy was so incensed by this constant weekly humiliation that the Luftwaffe high command planned a bombing raid targeting DC Thomson’s in Dundee. As it turned out, this was the least of their problems. 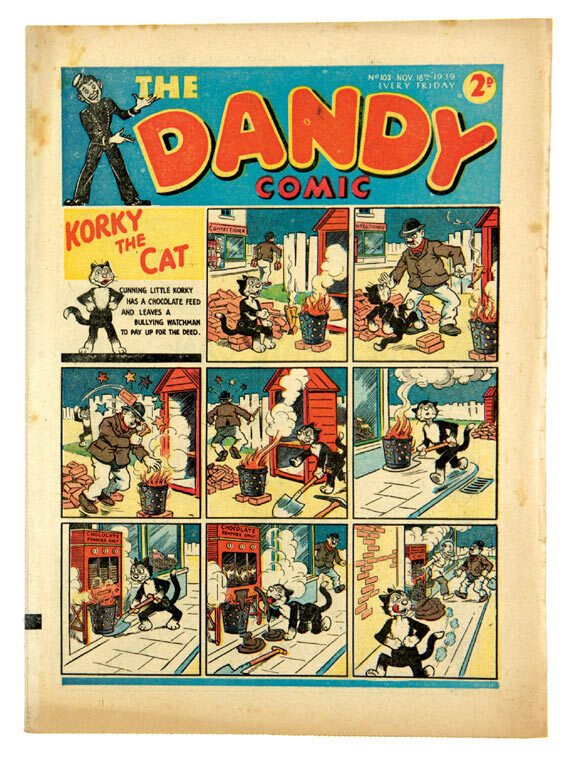 Korky, Keyhole Kate, and Freddy The Fearless Fly all did their bit but the offering of two new titles in different format, bigger and fresher in the mid Fifties were to take a big bite of the Dandy’s readership. Who would have thought that the introduction of Topper and Beezer would start the Dandy decline, amazingly introduced as rivals by their own publisher, D C Thomson. Of course this knife in the back of Desperate Dan harmlessly pinged away but a circulation scar remained. By the early Sixties Dandy distribution was so low that collectors now pay more for those issues than a decade earlier. Competition from the likes of Eagle, Lion, Valiant, Victor, TV 21 and TV At Home In Colour would also take their toll. Even Desperate Dan was losing his status to a boy with a shock of black hair and his wire-haired Abyssinian tripe hound of a pet dog. The Dandy has only survived for the time it has because its publishers are a private company and do not have to answer to concerned shareholders who would voice reservations about reduced circulation or lack of profitability. So will Desperate Dan finally saddle up and ride into the sunset after the last issue of The Dandy is published on December 4th? I don’t think so, but if he does, that sunset just might have a little door in the middle of it with a sign that says ‘The Beano’.